What is the optimal anti-pseudomonal treatment when Pa is first isolated? Whereas the median age for chronic infection used to be 5 years, its now around 25 years in the top US centres. Of course the million dollar question (there are many withn pseudomonas but the one we’re most concerned with) is which is the most effective course of treatment for eradication? While inhaled Tobramycin has been shown to transiently clear the pseudomonas from the lower airways – it doesn’t clear the lungs of the inflammation which is a key factor in the disease progression and continues the cycle of damage. In a study cited in this preso, patients were randomised to receive one of two aggressive approaches of 4 weeks inhaled Tobi vs 2 weeks of IV Tobi and Ceftazadine (which is what we do at our clinic) and then they had did a bronch wash of the lower airways (the gold standard to see what’s kicking about down there). The results showed that there was a difference in the inflammatory markers but it appears that the conclusions drawn were that the results were not significant enough to balance out the feasability, costs and side effects of the systemic IV antibiotic treatment. After one year the groups had no significant differences in BMI, FEV1, pseudomonal-specific igg – none of the markers that we care about. After 2 years, 10% of the patients had chronic pseudomonal infection in both groups. Again this study resulted in no major difference in the eradication profile. The Standford University team also looked at the timing approach for pseudomonal eradication protocols over a 5-10 year period with their own clinic. Group # 1 – After a positive Pa culture, they received the initial 28 days inhaled Tobramycin followed by a cycle of treatment for the next 5-6 months (presumably month on, month off). Group # 2 – Group # 1 – After a positive Pa culture, they received the initial 28 days inhaled Tobramycin followed by a second cycle of treatment if they continued to culture Pa in their swabs. That group that received the “cycle of treatment” irrespective of whether they continued to test positive or negative for Pa following the initial infection. Patients on the “cycle therapy” got their 5 rounds of antibiotic therapy post infection regardless of whether the sputum was clear or positive Pa after the initial treatment did not seem to be protected from exacerbations. So what is the gold standard of care when it comes to Pa? There is robust evidence that pseudomonas eradication treatment is effective but there is no definitive result to suggest that one method is superior to another. Heard of the TOBI Podhaler for psuedomonas treatment? 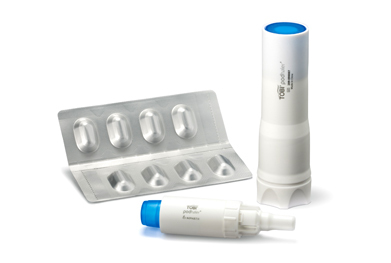 This device enables Tobramycin to be delivered via a portable handheld inhaler. It is eligible for use in CF patients, aged 6 years and older with proven Pseudomonas aeruginosa infection. Tobramycin delivered via this device has been shown to have comparable efficiency to nebulized TOBI (300 mg/5ml) and a similar side effect profile has been identified. Use of the TOBIR Podhaler R can result in more cough initially, which seems to reduce with use. Cough is lessened by administration of a bronchodilator medication prior to use. The TOBIR Podhaler R is taken twice daily for 28 days, every alternate 28 days. Each dose involves inhalation of 4 Podhaler capsules from the TOBIR Podhaler R twice daily. It takes about 5-6 minutes to administer all 4 capsules. 1. Any eligible patient attending the clinic must first be tested in the Respiratory Laboratory to assess whether inhalation of the TOBIR Podhaler R capsules irritates the airways. This test must be negative. Bronchodilator therapy is always administered in the laboratory prior to this assessment. 2. An initial 4 week trial of TOBIR Podhaler R capsules is undertaken. When this is completed, in order to qualify for continued PBS-subsidised therapy, a CF Team member must assess the ability of the patient to tolerate the dry powder formulation. 3. If this initial 4 weeks of therapy is tolerated, continuing treatment can occur. 4. Initial and continuing TOBIR Podhaler R therapy are obtained on Authority Scripts and have Streamlined Codes. Your GP can provide a script.